Place your oven racks to the upper middle and lower middle positions. Preheat your oven to 400F. In a small bowl add the olive oil, cumin and sea salt. Mix till combined with a fork. Brush both sides of your pita wedges with with the oil, cumin, sea salt mixture then place them on your (lined) cookie sheets. Bake the pita wedges 12 – 15 minutes, flipping the wedges over halfway through with a spatula/pair of tongs. You want both sides of the pita wedges to be nicely crisp. When your pita chips are done, it’s time to assemble the nachos. Take half of the pita chips and place them on your large plate. Add a few dollops of hummus onto the chips with a spoon. Crumble two falafel over the plate, being sure that some fall on top of the pita chips. Drizzle some tahini on top, if using. Add half of your sliced avocado and half of the thinly sliced red onion, again, scattering it over the pita chips. 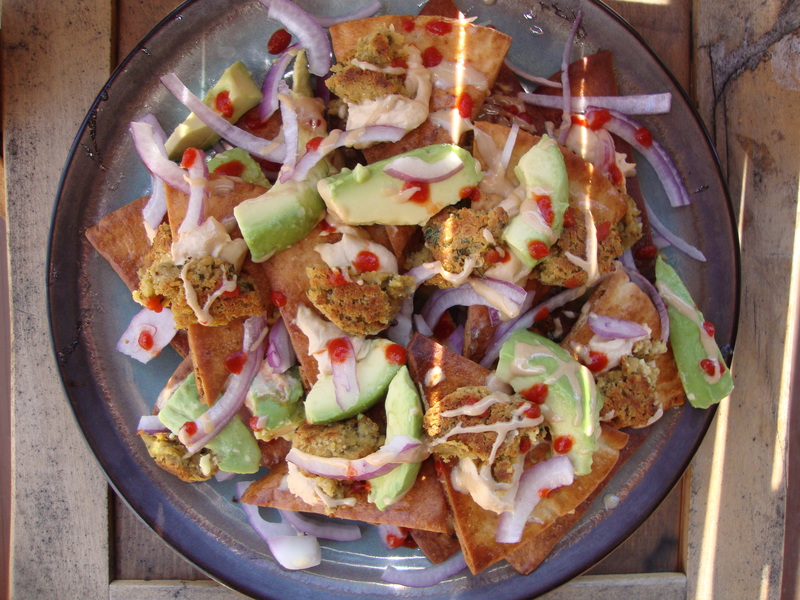 To finish it off, add a couple drops of sriracha, randomly over the nachos. Repeat the directions in the above paragraph for your second layer (but seriously, there is no wrong way to do this, it’s all delicious smashed up together and scooped up into your mouth). Serve immediately. It was so good! I made it again yesterday and decided it needed to be shared. I know, I know, not everyone is a Brady fan. And I’m not even that big of one. I honestly just have to send out some love to the guy that can make or break Roo’s mood for the next couple weeks. Haha.